Posted Nov. 20, 2018 at 3:08 p.m.
View the original article here in Appalachian Today. BOONE, N.C. — During the kick-off talk in Appalachian State University’s fall 2018 Sustainable Energy Speaker Series: Alumni Edition, Bill Pfleger ’04 ’06 ’13 said the U.S. electricity system, which has served the nation for more than 100 years, “is standing on the brink of disruption” — and that’s a potentially good thing. In his presentation titled “The New Energy Landscape: Microgrid Trends and Future Directions,” Pfleger, solutions architect manager for energy management company Schneider Electric, said four global movements are spurring the disruption in the nation’s outdated electrical grid. 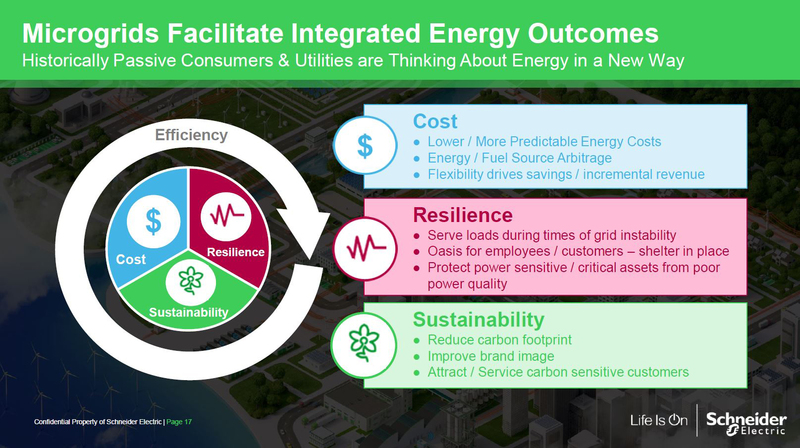 Microgrid technology can capitalize on these trends, Pfleger said, helping individuals, businesses and utility companies alike achieve integrated energy outcomes. Pfleger, a three-time graduate of Appalachian, holds a B.S. in psychology, an M.S. in general experimental psychology and an M.S. in technology with concentrations in appropriate technology and building science. The “energy landscape,” as Pfleger terms it, is moving from a linear model — one in which the transference of electricity moves from a central power plant through power lines and directly to consumers — to a more decentralized model that is “increasingly complex and multidirectional,” he said. The world is becoming more digitized — by 2025, the world will contain 10 times more connected devices than people (IHS Markit, “IoT platforms: enabling the Internet of Things,” 2016). The world is becoming more decarbonized — 82 percent of untapped energy efficiency potential is in buildings and more than 50 percent is present in industry (IEA, 2012 World Energy Outlook). The world’s energy sources are becoming more decentralized — 70 percent of new energy capacity, or the maximum possible output of electricity, will consist of decentralized renewables by 2040 (Bloomberg New Energy Finance, New Energy Outlook 2017). The world is becoming more electric — electricity demand will experience a growth rate two times faster than electricity production by 2040 (IEA, 2014 World Energy Outlook). Other trends driving change in the world’s energy landscape, Pfleger said, include an increased movement toward renewable energy, the declining cost of solar technology, the increasing affordability of energy storage, the natural gas boom and such technologies as electric vehicles (EVs). Pfleger defined a microgrid as “an integrated energy system” that can contain a mix of several renewable and/or fossil fuel-based distributed energy resources (DERs), such as solar panels, wind turbines, diesel backup generators, batteries, etc. The benefits for users, he said, are threefold: The energy microgrids provide is sustainable, cost-effective and resilient. Some microgrids operate while being continuously synced to a larger electricity grid, Pfleger said, while others, depending upon their complexity, are able to operate as an island — meaning the microgrid can disconnect from the larger grid and be an independently operating source of dependable power supply for its users. Pfleger said typical power monitoring suggests that an electrical system needs to have a DER ratio of 2-to-1 — or a balance of two traditional energy sources (fossil fuels) for every one renewable energy source. “The current state of microgrid technology is a little bit like the Wild West,” Pfleger said, with many competitors of all different types, ranging from start-ups to multinational corporations such as Schneider and General Electric Co., all with their own approach to microgrid design. Pfleger said a microgrid could power Appalachian’s main campus. “One of the things I’ve always valued about Appalachian State University is its investment in renewable energy, and you have some amazing assets right here on campus to be leveraged already,” Pfleger said. 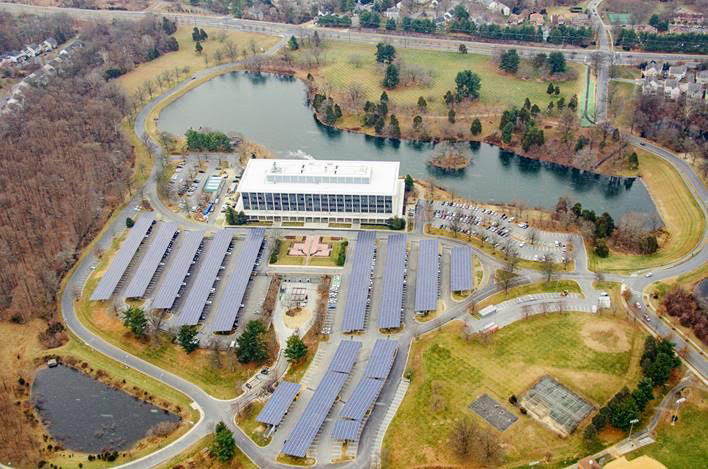 Raichle pointed to the university’s Innovation Campus, to be located at the site of the former Broyhill Inn and Conference Center on Bodenheimer Drive and the edge of the neighboring Nature Preserve, as a possible ideal space for a microgrid facility that could power Appalachian’s main campus and showcase renewable energy technologies. “Some of us in the department see the development of the Innovation Campus as a really unique opportunity to be far out on the leading edge of those using sustainable energy technologies. This is an opportunity we cannot miss,” he said. The Innovation Campus will embrace multiple disciplines and include collaborations both on campus and with the community. The Sustainable Energy Speaker Series — a joint effort of the Appalachian Energy Center and the Department of Sustainable Technology and the Built Environment — will resume Monday, Nov. 26, with a talk by Appalachian alumnus Landon Williams, a senior public engagement specialist with Duke Energy. For more information about the series, click here. One of seven departments housed in the College of Fine and Applied Arts, the Department of Sustainable Technology and the Built Environment at Appalachian State University features an integrated array of programs spanning the fields of sustainable design and technology. Its mission is to foster a strong and vibrant culture of inquiry, discovery and innovation that integrates theory with application, problem seeking with problem-solving, local issues with global perspectives and technological progress with environmental stewardship. It offers bachelor’s degrees in sustainable technology and building science, and a master’s degree in technology. Learn more at https://stbe.appstate.edu.